On November 17, 1884, 12-year-old Lillian Clay Goolsby walked onto the MSA campus for the first time. As thrilled as she must have been to be beginning a new chapter in her life, it is unlikely that Lillian was able to relax and enjoy her new surroundings fully. The daughter of a local saddlemaker and shoemaker, Lillian entered the towering doors of Old Main that fall day as MSA’s first female student. 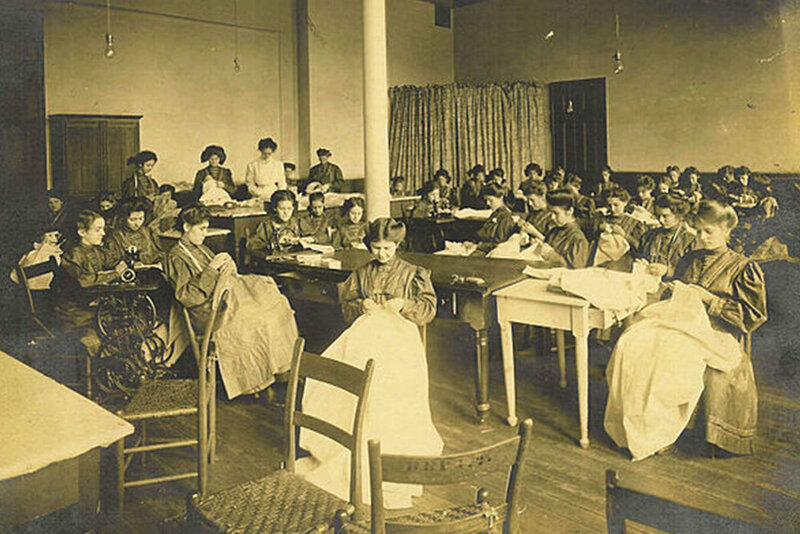 What was referred to as the “Girls Department” at MSA quickly grew and became one of the most progressive programs for educating young women in the country. Like the boys, the girls were provided a robust and rigorous academic program that included Latin, German, history, rhetoric, philosophy, science, and math. More surprisingly for that era, they also learned mechanical engineering, farming, printing, telegraphy, and woodworking. Furthermore, female students were invited into a literary society created by Virginia Vawter, the wife of the school’s first superintendent. Along with her new classmates, Lillian Goolsby received a remarkable education. And she eventually must have found time to relax and enjoy the scenery at MSA. She graduated in 1891 and went on to work as a school teacher and later a census verifier in Cuba. This winter during WWOWW, Ms. Dana Ainsworth worked to capture the peaceful aromas and relaxing effects of nature present on campus in handmade soaps, candles, and salt scrubs in a course name after MSA’s pioneer female student called LC Goolsby Apothecary. Students learned how to utilize the botanicals found locally in nature to design custom fragrances by blending herbs, oils, and other natural botanicals. They worked to craft calming scents and smells produced by nature in products that can be packaged and used at home. Miller School is a beautiful place full of aromas distinct to the foothills of the Blue Ridge Mountains. Since many students board and depart in the summer, apothecary serves as a way to package the peaceful and calming aromas on campus so that students can take them home with them. In addition to apothecary, students studied marketing and branding. They paid tribute to MSA’s first female student and created an engaging brand for their product. By weaving together the natural smells and scents of MSA with a historical tribute to the school’s first female student, they were able to create a product that is uniquely Miller School and has a memorable story behind it. Each candle, soap, and scrub produced during the class was carefully wrapped in custom-branded LC Goolsby Apothecary packaging. Students in the course are currently planning to develop a business plan to sell LC Goolsby Apothecary products in local Charlottesville markets, as well as offer them online for friends of the school to purchase. “It was wonderful to learn about a woman who is such an important part of MSA’s history and to be able to work on a project that she may have worked on during her years on the Hill,” commented Remy Lusk. It’s a happy ending to a story that started a long time ago, when a nervous Lillian Clay Goolsby took her first tentative steps onto the MSA campus. Little did she know then that someday she would become a brand name. The MSA students may not make it onto ABC's Shark Tank, but they're proving themselves to be genuine entrepreneurs. As a great entrepreneur himself, Samuel Miller would be proud of them and of his decision to include girls in the school named after him.